Microsoft Multi-Site Failover Cluster is a group of Clustered Nodes distribution through multiple sites in a region or separate region connected with low latency network and storage. 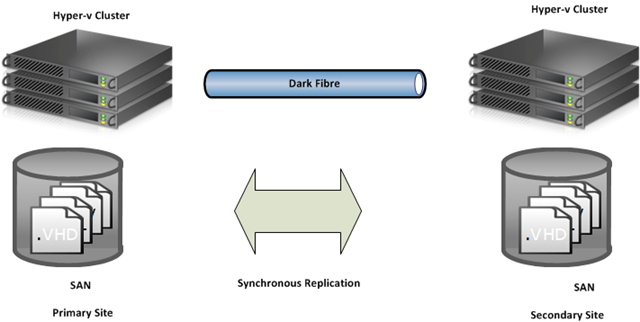 As per the diagram illustrated below, Data Center A Cluster Nodes are connected to a local SAN Storage, while replicated to a SAN Storage on the Data Center B. Replication is taken care by a identical software defined storage on each site. Software defined storage will replicate volumes or Logical Unit Number (LUN) from primary site in this example Data Center A to Disaster Recovery Site B. Microsoft Failover cluster is configured with pass-through storage i.e. volumes and these volumes are replication to DR site. In the Primary and DR sites, physical network is configured using Cisco Nexus 7000. Data network and virtual machine network are logically segregated in Microsoft System Center VMM and physical switch using virtual local area network or VLAN. A separate Storage Area Network (SAN) is created in each site with low latency storage. Volumes of pass-through storage are replicated to DR site using identical size of volumes. 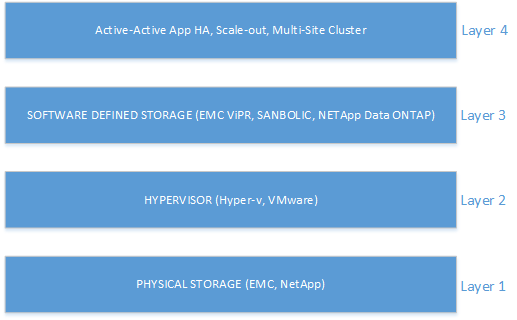 If Storage is presented directly to virtual machines or cluster nodes then NPIV must configured on the Fabric Zones. If a third party software is used to replicate storage between sites then storage vendor must be consulted before the replication. Use case can be determined by current workloads and future workloads plus business continuity. Deploy Veeam One to determine current workloads on your infrastructure and propose a future workload plus business continuity. Here is a list of use cases of multi-site cluster. Scale-Out File Server for application data- To store server application data, such as Hyper-V virtual machine files, on file shares, and obtain a similar level of reliability, availability, manageability, and high performance that you would expect from a storage area network. All file shares are simultaneously online on all nodes. File shares associated with this type of clustered file server are called scale-out file shares. This is sometimes referred to as active-active. File Server for general use – This type of clustered file server, and therefore all the shares associated with the clustered file server, is online on one node at a time. This is sometimes referred to as active-passive or dual-active. File shares associated with this type of clustered file server are called clustered file shares. In most of the SMB customer, the nodes of the cluster that reside at their primary data center provide access to the clustered service or application, with failover occurring only between clustered nodes. However for an enterprise customer, failure of a business critical application is not an option. In this case, disaster recovery and high availability are bonded together so that when both/all nodes at the primary site are lost, the nodes at the secondary site begin providing service automatically, or with minimal intervention. The maximum availability of any services or application depends on how you design your platform that hosts these services. It is important to follow best practices in Compute, Network and Storage infrastructure to maximize uptime and maintain SLA. The following diagram shows a multi-site failover cluster that uses four nodes and supports a clustered service or application. 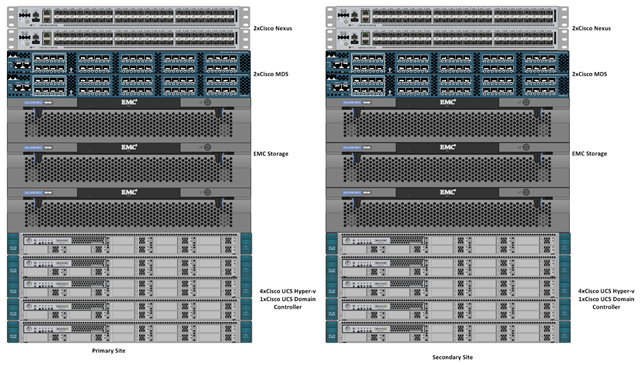 The following rack diagram shows the identical compute, storage and networking infrastructure in both site. Each site must have redundant power supply. Since I am talking about highly available and redundant systems design, this sort of design must consist of replicated or clustered storage presented to multi-site Hyper-v cluster nodes. Replication of data between sites is very important in a multi-site cluster, and is accomplished in different ways by different hardware vendors. You will achieve high performance through hardware or block level replication instead of software. You should contact your storage vendor to come up with solutions that provide replicated or clustered storage. A multi-site cluster running Windows Server 2008 can contain nodes that are in different subnet however as a best practice, you must configure Hyper-v cluster in same subnet. You applications and services can reside in separate subnets. To avoid any conflict, you should use dark fibre connection or MPLS network between multi-sites that allows VLANs. Note that you must configure Hyper-v with static IP. In a multi-site cluster, you might want to tune the “heartbeat” settings, see http://go.microsoft.com/fwlink/?LinkId=130588 for details. Note that iSCSI network is only required if you are using IP Storage instead of Fibre Channel (FC) storage. Quorum Selection: Since you will be configuring Node and File Share Majority cluster, you will have the option to place quorum files to shared folder. Where do you place this shared folder? Since we are talking about fully redundant and highly available Hyper-v Cluster, we have several options to place quorum shared folder. Visit http://technet.microsoft.com/en-us/library/cc770620%28WS.10%29.aspx for more details on quorum. Visit https://araihan.wordpress.com/2013/06/04/windows-server-2012-failover-clustering-deep-dive/ for detailed cluster configuration guide. Visit http://www.starwindsoftware.com/images/content/technical_papers/StarWind_HA_Hyper-V_6.0.pdf , http://docs.us.sios.com/ and http://us.sios.com/wp-content/uploads/sios-datakeeper-replication-multi-site-clustering-windows-servers-enterprise.pdf for clustered storage configuration for Hyper-v.
Visit http://microsoftguru.com.au/2013/06/04/windows-server-2012-failover-clustering-deep-dive/ for detailed cluster configuration guide.